Last fall at the POD Network conference for educational developers, I interviewed D. Christopher Brooks for Vanderbilt’s Leading Lines podcast. I met Christopher at a Lilly conference years ago, and we’ve been colleagues via Twitter ever since. I talked with him about active learning classrooms, a research interest of his, and about his work at EDUCAUSE. He had a lot of great things to say (and you can hear the whole interview here), but what stood out the most to me was hearing that active learning classrooms (ALCs) were identified as a top strategic technology in EDUCAUSE’s 2017 survey of higher education information technology leaders. It was the first time ALCs made the top ten, and they entered the list at #1. I was excited to hear that, and a little surprised. I’ve been interested in learning spaces for years (my first blog post on the topic was in 2013), but I haven’t found that IT leaders pay much attention to the topic. 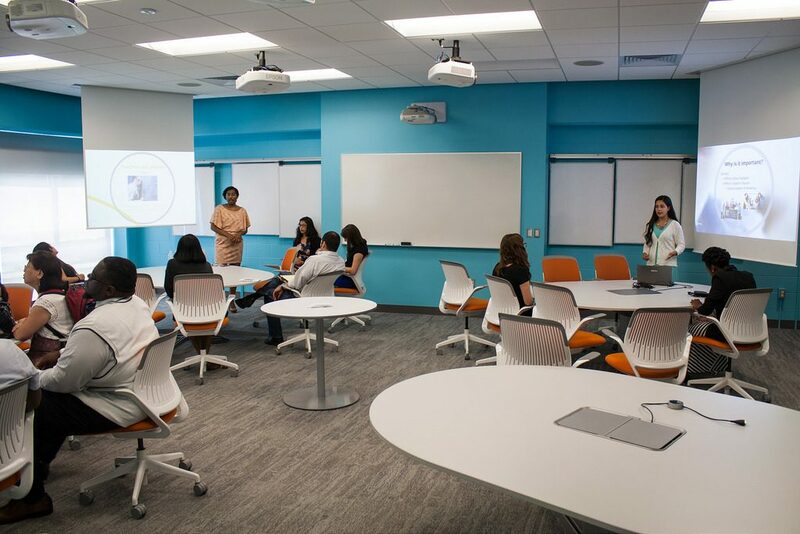 Sure, they talk a lot about the audio-visual technology that goes in campus classrooms, but flexible furniture and active learning pedagogies aren’t terms I’ve heard much from those designing classrooms on my campus and elsewhere. Clearly, however, something has changed. The EDUCAUSE survey is a sign of that change, as are conversations I’ve had in the last month at my university. I was thrilled to hear a campus planner describe a few classrooms under construction at our education school as “active learning classrooms,” and I’ve been invited twice this fall to share research about ALCs to various campus planning committees. Given all this interest in active learning classrooms, I thought I might review what we know about ALCs here on the blog. What follows is just a primer on ALC research, and I know I’ll leave out a few key studies. If you’re looking for a more comprehensive literature review, I recommend the book that D. Christopher Brooks co-authored, A Guide to Teaching in the Active Learning Classroom: History, Research, and Practice (Stylus, 2016). It’s the book on ALCs, as far as I’m concerned, and I’ll lean on it for our working definition of an ALC. What is an active learning classroom? ALCs feature “round or curved tables with moveable seating that allow students to face each other and thus support small-group work. The tables are often paired with their own whiteboards for brainstorming and diagramming” (Baepler, et al., 2016). 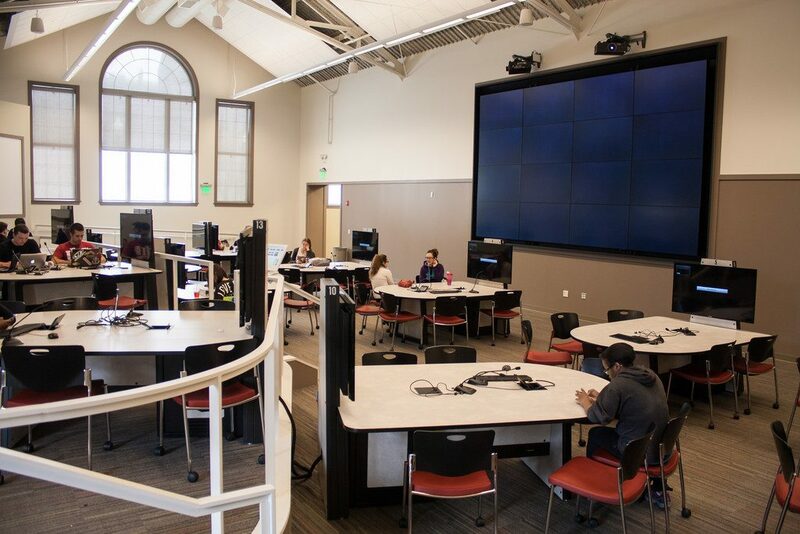 Some ALCs also feature multiple displays, allowing instructors and students to project their laptops around the room, and some include microphones for sound projection. Wifi and power is critical for student laptops and smart phones. Throughout this blog post, I’ve included photos of ALCs I’ve taken while visiting other campuses. Note that ALCs are more or less flexible depending on the kind of furniture used. 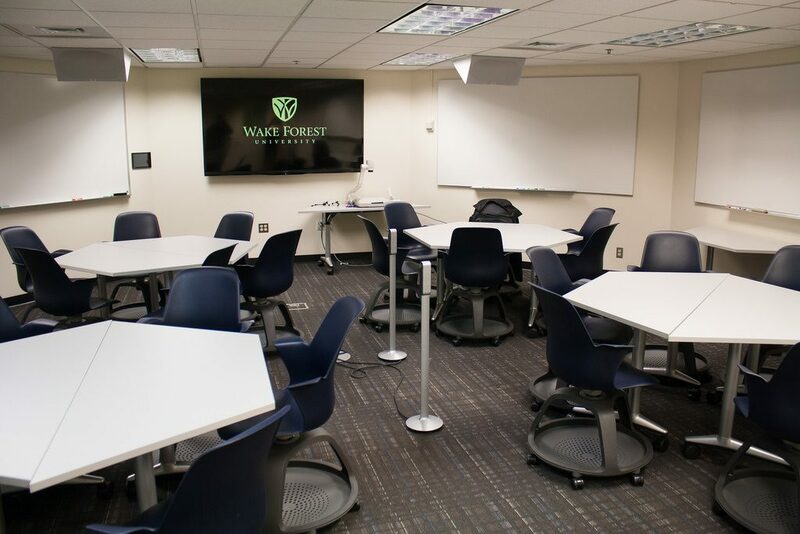 The Mosaic classroom at Indiana University, for instance, has fixed tables, while the computer science classroom at Wake Forest University features small, movable tables. Why are active learning classrooms useful? In the STEM disciplines (science, technology, engineering, mathematics), active learning instruction, defined as practice that “engages students in the process of learning through activities and/or discussion in class, as opposed to passively listening to an expert,” is known to be more effective than traditional lecturing for student learning and student success (Freeman et al., 2014). This finding seems to be controversial, with lots of faculty members over the years writing essays in defense of the lecture, but the research is clear: If your instruction involves “continuous exposition by the teacher,” there’s a better way to teach. That’s true in the STEM disciplines, and it’s likely true in other fields, too, although there’s not as much research on active learning in, say, the humanities. Active learning classrooms are useful, then, because research shows that the affordances of ALCs facilitate adoption of active learning instruction, which leads to greater student learning (Whiteside, Brooks, & Walker, 2010; Baepler, Walker, & Driessen, 2014). This is good news for institutions who want more active learning classrooms, but can’t afford the high-end tech in all of them. Building out flat classrooms with good tables, moveable chairs, and lots of whiteboards is a great way to support active learning instruction. I also interviewed Cornelia Lang, associate professor of astronomy at the University of Iowa, for Leading Lines. She teaches regularly in active learning classrooms, and she describes in detail her teaching practices in those spaces in her interview. She also noted that her colleagues in physics and astronomy have figured out what Soneral and Wyse did, that it’s the tables and whiteboards that really enable active learning instruction. Her department is moving to a low-tech ALC model for most of their classrooms as they have the chance to renovate their classrooms. I’ll wrap up this brief introduction to research on ALCs by noting that faculty development is often critical to the success of an ALC initiative (Morrone, et al., 2017). 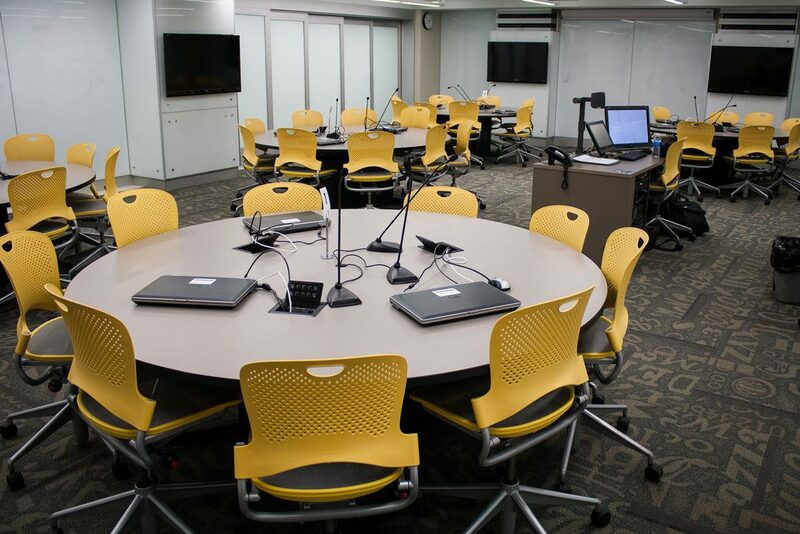 Many ALC initiatives, including those at University of Iowa and Indiana University include professional development provided by a teaching center. This is why D. Christopher Brooks and colleagues wrote their book. “Sometimes, it’s overwhelming enough just developing an active learning exercise to work on with students in order to achieve your objectives… This is part of why we wrote the book, to help folks figure out the kinds of things that they can do, the kinds of barriers they’ll going to find in those spaces and to think through how teaching in this space is different than teaching in a traditional classroom.” I’m a little biased, but if you’re going to launch an ALC on your campus, you should reach out to your local teaching center to provide teaching consultations to instructors using the ALC. If I’ve missed an ALC study that you find really interesting or useful, let me know! And if you’d like to see more photos of ALCs and other learning spaces, visit my learning spaces album on Flickr. 5 Responses to "Active Learning Classrooms: What We Know"
Derek, thanks for this very good synopsis of where things stand with respect to ALCs. Since you asked, one study that deserves to be thrown into the mix is Stoltzfus & Libarkin’s “Does the Room Matter? Active Learning in Traditional and Enhanced Lecture Spaces”, https://www.ncbi.nlm.nih.gov/pmc/articles/PMC5132365/. The authors of this study found that space does not matter to student learning except insofar as it encourages instructors to use active learning techniques, and then it is those techniques, rather than the learning space itself, that improve student outcomes. This stands in contrast to what my colleagues and I found in our work at Minnesota, which was that space DOES matter to student outcomes, even while controlling for teaching methods. I have some thoughts about why Stoltzfus & Libarkin didn’t reach the same conclusions that we did, but in any case theirs is good work, and your readers can decide for themselves what the right conclusion is! Derek – Thank you for sharing all of these excellent resources and photos. 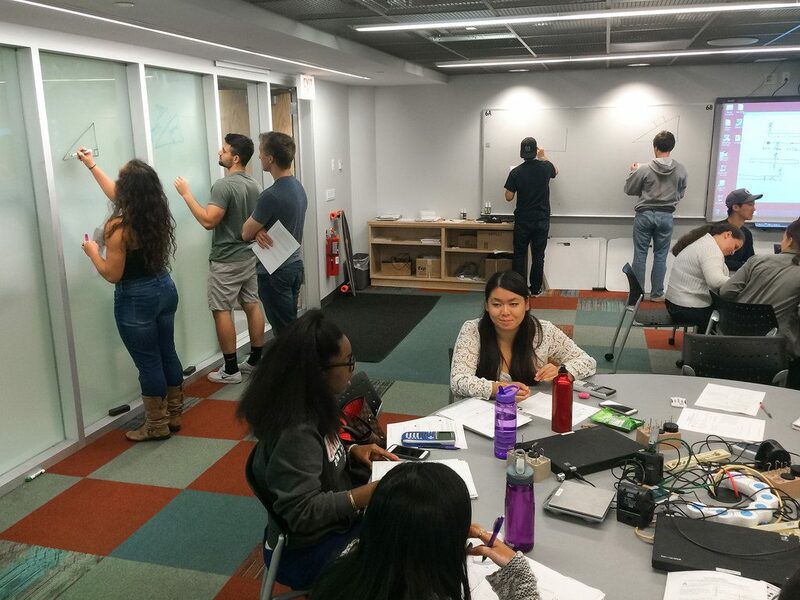 I would agree whiteboards and tables are key components of the physical space design of ALCs – although their impact tends to be limited to just students physically in the room. Soneral and Wyse looked (I believe) at classrooms where all of the students are in the room physically. A challenge we have been tackling in our schools is how to truly extend the impact of the ALC by providing as close to the same learning experiences & relationships for students not physically in the ALC as those within the ALC. In those scenarios, many best practice ALC design principles become more challenging to implement – and (not suprisingly) “high-tech” tools are critical to bridge the physical with the virtual. Perhaps worthy of further research! Thank you for this great article! And I want to let your readers know that you can find many of these examples and others in FLEXspace, a valuable resource that is FREE for academic users. There are hundreds of examples of many types of learning spaces including many ALCs. The Flexible Learning Environments eXchange is a one-stop shop for learning space planning and design resources, examples, research and an extensive community of practice. I want to encourage you all to visit FLEXspace.org and register so you can start exploring and upload your own learning spaces to the collection. You’ll see on our home page a short video that explains “What is FLEXspace” so you can learn more about how to leverage this resource to save time, money, and effort on your campus.